Camp Oak View, Bir Billing is one of the theme based Camping for camping experience only. Experience is full outdoors with camping in Oak forest. Camping is different experience then your stay at hotels. Camping is outdoor and feels your outdoors. Food at Camps is not at your doorstep, you have to walk to dining area for meals. Hike to nearby forest area and village, hike to sunset point. Chat with fellow traveler at Bonfire. Share your experiences with them. Camping is all about outdoor. Go to camp for sleep only. 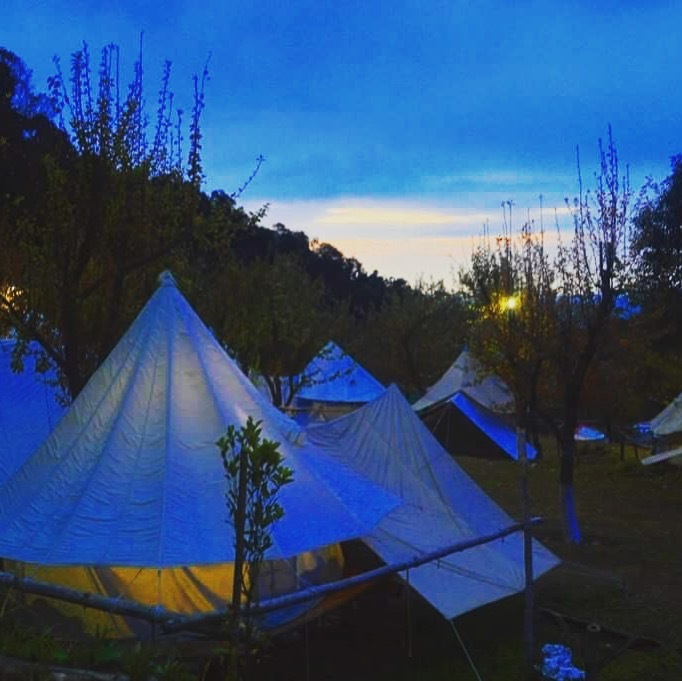 Camp Oak View tents are equipped with quilts, blankets, proper mattress, electricity, charging point, and hot water bags if required in winters. Your experience is more important for us. We believe on hospitality. Camp Oak view is not place for party, its for feel at nature’s lap. We offer various activity options, Camping at Oak View, Camping at Billing in dome tents, trekking options to tribal villages, trekking to View points and forest camping, mountain Biking, visit to monasteries here at Bir and Bhattu. Paraglide with best team of Mr. Arvind Paul. Its not randam with any team. Visit our trip advisor review and experience best with us. Camp Oak View has 10 Tents elevated on Bamboo and with mud base provide insulation in winter from ground. Camp Oak View, Bir Billing has 10 tents – all tents are triple beds. We offer tents on Twin and triple sharing based on requirement. Camping has hike to nearby village through Oak and pine forest to village temple and a hike to sunset point. Camp has Indian and western clean and hygienic toilets. 6 bathrooms to take bath – both hot and cold water at Camping. Bonfire in the evening at the camp site. Camp has in house cook. Food Prepared locally at Camp Oak View. Camping is not for stay its for experience, you remember for log time and we are committed to serve you the best we can do for hospitality at Camp Oak View, Bir Billing. We also have hotel in Bir – do visit link for hotel details at Bir, himachal Pradesh.